CarGurus has 40,963 nationwide Traverse listings starting at $2,500. The 2014 Chevy Traverse excels with regard to delivering safety, both in terms of available features and how well this family vehicle performs in crash tests. Roomy, safe and dynamically satisfying, the 2014 Chevrolet Traverse delivers full-size SUV space in a more fuel-efficient crossover SUV package. The main concession over a traditional SUV is the Traverse’s lower maximum tow rating, but it can nevertheless tug a weightier trailer than most crossovers. Also, you can easily save thousands of dollars off the sticker price, offsetting average predicted reliability and cost-of-ownership ratings. Lots of people need a minivan, but they don’t want to be seen behind the wheel of one—not even when leaving the rental-car lot at the airport. For people like this, the 2014 Chevrolet Traverse is a terrific alternative, a minivan in almost every respect except that it has a longer hood, less space inside and, instead of super-handy sliding side doors, gigantic hinged rear doors that make it particularly difficult to load passengers in tight parking spaces. Especially little kids riding in child seats. But hey, at least it’s not a Mommymobile, right? 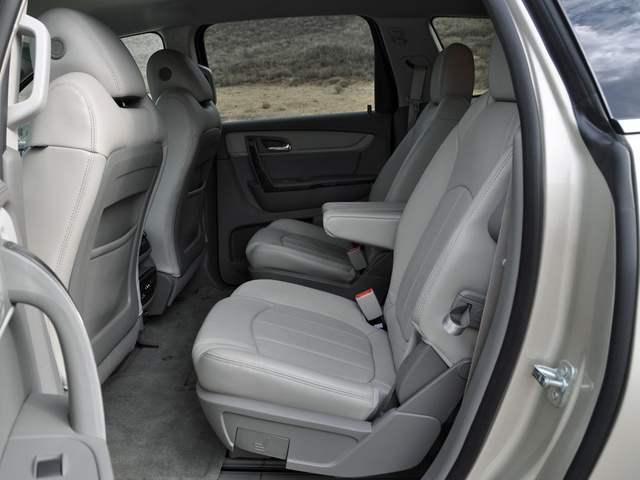 Designed to seat up to 8 people, just like a minivan, the 2014 Chevy Traverse is sold in LS, 1LT, 2LT and LTZ trim levels with a choice between front-wheel and all-wheel drive. Prices start at $31,670 for a Traverse LS with front-wheel drive and climb to more than $50,000 for a Traverse LTZ with all-wheel drive (AWD) and all the extra-cost factory-installed goodies. Add the dealer-installed accessories and the price rises even higher. Upgrading to the 1LT model installs aluminum wheels, foglights, remote engine start, rear parking assist sensors, a front-center airbag and nicer trim inside and out. A greater array of options is also offered for the Traverse 1LT model. Select the Traverse 2LT for triple-zone automatic climate control, heated front seats, second-row captain’s chairs, a universal garage door opener, auto-dimming mirrors, a power rear liftgate, Chevrolet MyLink technology and a Bose premium audio system with rear-seat audio controls and headphone jacks. The Traverse LTZ is the top-of-the-line model, and that’s what I spent 9 days driving over the Christmas holiday, ferrying my family members to more festive gatherings than one ought to cram into a week. The LTZ trim is equipped with leather seats, ventilated front seats, memory for the driver’s settings, an 8-way power adjustable front passenger’s seat, a heated steering wheel, a side blind-zone alert system, a lane-departure warning system, a forward collision warning system, chrome exterior trim and 20-inch aluminum wheels. To this, my Champagne Silver test vehicle added a navigation system and a rear seat entertainment system, for a grand total of $46,370. Though the Traverse is now 6 years old, and the platform upon which it is constructed dates back 8 years, I find it to be an appealing design, inside and out. Exterior styling updates for the 2013 model year pulled off a rare trick: They neither helped nor hurt. Also, aside from dark gray plastic ringing the bottom of the Traverse and protecting it from rock chips, this crossover SUV is thankfully devoid of silly rugged design cues like fake skid plates and corrugated rocker-panel topography. As a result, the Traverse is clean and attractive, especially in higher levels of trim and with larger wheels installed. Inside, the 2013 model year refresh upgraded the quality and appearance of the interior and its materials. Though questionable choices remain, they’re somehow more acceptable and easier to overlook in a Chevy than in the Traverse’s platform-mates, the GMC Acadia and Buick Enclave. The feature color in the photos on Chevy’s website is Mojave, but I prefer my test vehicle’s less garish Titanium cabin color combination, executed in dark and light tones, in part because the charcoal wood-tone trim looks much better than the simulated burl walnut plastic trim that Chevrolet supplies with Mojave and Ebony color choices. At night, blue ambient lighting strips highlight the dashboard, but look inexpensive upon closer inspection. Better to do this right, Chevrolet, or not do it at all. 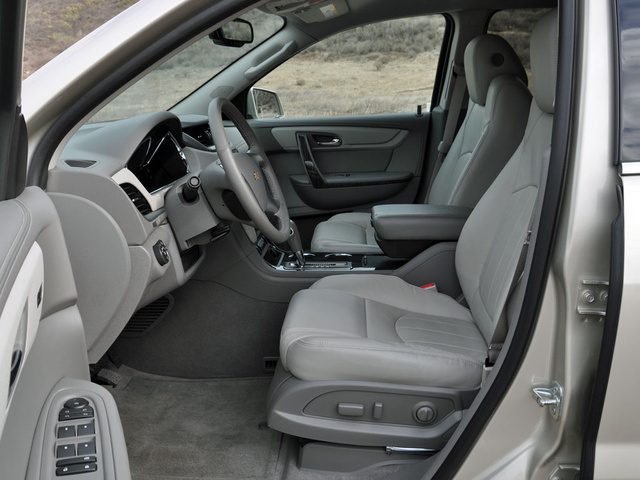 In addition to looking good, inside and out, the 2014 Chevy Traverse is surprisingly dynamic to drive. A 3.6-liter V6 engine cranks between 281 and 288 horsepower to the crossover’s front wheels, depending on trim level. A 6-speed automatic transmission is standard, an AWD system optional, and while the powertrain is charged with motivating a minimum of 4,646 pounds of SUV before adding a driver or any passengers, it never feels as though it is lacking for oomph. Plus, it tows a maximum of 5,200 pounds, more than most crossovers. Additionally, despite its full-size dimensions, the Traverse feels fairly nimble from behind the steering wheel. This SUV tackles crowded parking lots and busy city streets with as much capability as it does fast-moving freeways and curving country roads. Variable-effort power steering is included for all Traverse models except the LS trim level, and it proves both responsive and communicative even if the wafer-thin steering wheel rim feels unsubstantial in your hands. Just watch its rather wide 40.4-foot turning circle when tucking into tighter parking spaces and negotiating drive-thru windows. My LTZ test model, with 20-inch aluminum wheels, offered an excellent blend of ride comfort and secure handling, feeling connected to the pavement at all times yet delivering a composed ride quality even over the lousier sections of my test route. Though this is an aging design, the Traverse’s underlying structure remains a stout one, and that translates to unexpected athleticism combined with impressive resistance to bumps and holes in the road. The standard 4-wheel-disc brakes work well, too, helping to contribute to the sensation that the Traverse is smaller and lighter than it is. 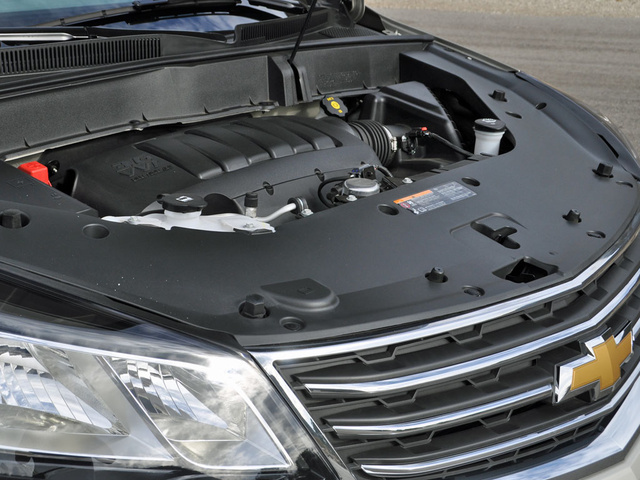 Where the Traverse’s substantial weight is most evident is with regard to fuel economy. With my LTZ AWD test vehicle, I averaged 17.8 mpg during a week of driving, and while that’s not far off the EPA’s estimate of 19 mpg in combined driving, neither is this performance a Traverse strong suit unless you’re comparing it to a traditional full-size SUV such as a Chevy Tahoe or Suburban. Previously, I indicated the Traverse’s interior materials are better than ever. That’s true, though it bears mentioning that the higher the price tag rises, the less impressive they are. There are also multiple examples of unexpectedly high and low quality and execution. For instance, the trim panel beneath the gauge cluster and above the steering column is soft to the touch, entirely unexpected in just about any regular production vehicle, let alone one wearing a Chevy bowtie badge on its grille. Yet the adjustable front seat headrests are thinly padded and balky to operate. Generally, though, most Traverse buyers are likely to feel that they’ve gotten what they paid for in terms of interior quality. Comfort levels are acceptable, and no more. Up front, I had trouble achieving the right mix of seat height, bottom-cushion tilt and steering-wheel position to provide my preferred combination of height, thigh support and outward visibility. Plus, even with the power lumbar support bladder fully deflated, it still poked uncomfortably into my back to such a degree that I could never own one of these vehicles. The second-row captain’s chairs slide fore and aft to add legroom for third-row passengers, and to make it easier for adults to access the third-row seat, but they sit rather low in the vehicle. My kindergartener, who uses a booster seat, had lots of trouble snapping the seatbelt into the rigidly mounted latch, meaning that Mom and Dad spent lots of extra time making sure she was properly secured. That same rigid seatbelt latch also makes it harder to secure the LATCH straps for a conventional child safety seat without hurting one’s knuckles. Third-row seating accommodations are comfortable enough when captain’s chairs are installed for the second-row seating area, because occupants can stretch their legs. With a second-row bench seat, not so much. Entry and exit are fairly easy, and older kids will have no trouble seeing out. 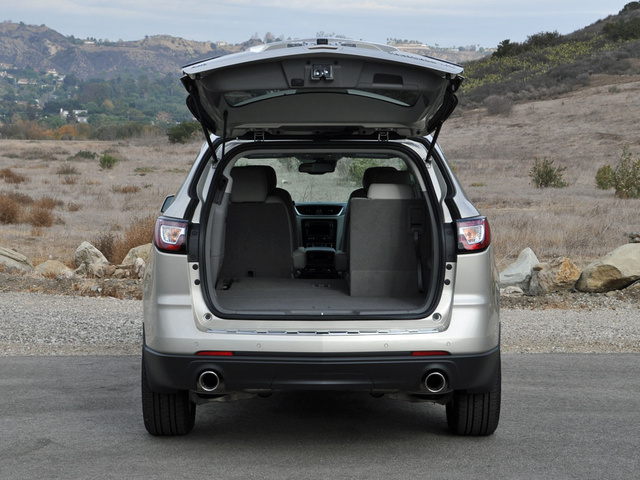 Behind the third-row seat, the Traverse can swallow 24.4 cubic feet of cargo when it is stacked to the roof. Realistically, you can use about two-thirds of that space. Fold the 60/40-split rear seat down to enjoy 70.3 cubic feet of cargo space, which is as much as or more than most compact crossover SUVs can carry with just 2 people aboard. Maximum cargo volume measures 116.3 cubic feet, nearly as much as in the redesigned 2015 Chevy Suburban. 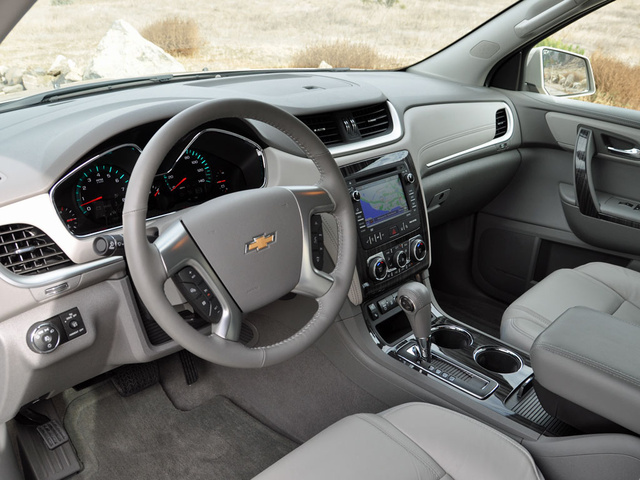 As for the Traverse’s interior controls and layout, everything makes sense until you want to use the MyLink infotainment system, the steering wheel controls or the vehicle’s trip computer. Then, a mix of small and often cryptic pictographic markings, combined with the MyLink system’s touch-sensitive panel surround, can make referencing vehicle data, switching between MyLink screens and performing other common tasks more distracting and difficult than they really need to be. Though big knobs and buttons are included for stereo volume and tuning, this still isn’t an ideal arrangement. Chevrolet installs its OnStar telematics system in every 2014 Traverse and includes a free 6-month subscription to service. In addition to several safety-related features outlined below, OnStar provides stolen vehicle tracking, turn-by-turn navigation, on-demand diagnostics assessments and the ability to remotely unlock the doors or locate the vehicle by flashing the lights and sounding the horn. A RemoteLink mobile application allows Traverse owners to access certain features and functions remotely using a smartphone application, and an opt-in FamilyLink service provides vehicle location alerts. In addition to OnStar services, the Traverse is offered with Chevrolet MyLink smartphone connectivity technology. Though flawed due to the SUV’s rather small 6.5-inch color touchscreen, this remains a fairly good infotainment system in terms of features, and the large volume and tuning knobs help make using the stereo easier. Owners can customize MyLink’s home page with large touch-sensitive menu icons, and system highlights include Bluetooth streaming audio, access to Internet radio stations, access to phonebook contacts and music libraries, and more. A navigation system is extra, costs just $795 and is mostly a breeze to program. My test vehicle also had a rear-seat DVD entertainment system, which costs $1,445. It includes a single rear screen, wireless headphones, a Bose 5.1 Surround Sound audio system, and video-game input jacks. It kept the little ones awake during post-party drives home, making it much easier to get them into their jammies and tucked into bed. Also, note that for 2014 Chevrolet adds charge-only USB ports for rear-seat passengers to use. 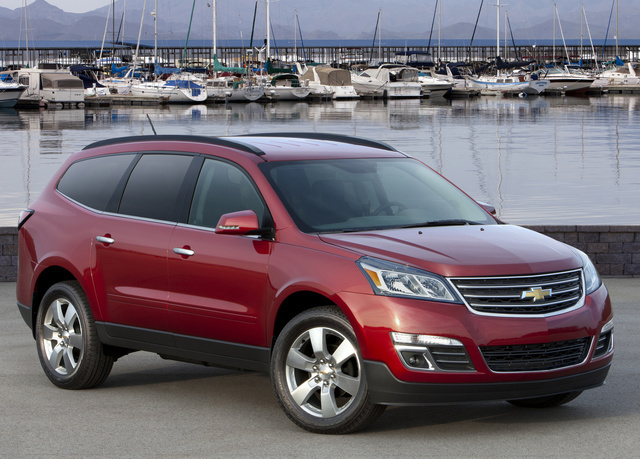 The 2014 Chevy Traverse excels with regard to delivering safety, both in terms of available features and how well it performs in crash tests. Standard equipment includes a reversing camera and OnStar services including automatic crash response, crisis assist and emergency services. Choose the 1LT or 2LT trim, and Chevy throws in a set of rear parking assist sensors. Optional for the LT2 and standard for the Traverse LTZ, new forward collision alert and lane-departure warning systems add modern safety technology to the SUV for the 2014 model year. Neither is perfect—the forward collision warning system occasionally delivered false alerts, and the lane-departure warning system sometimes failed to read lane markings—but both features also grabbed my attention on more than one occasion. Unfortunately, and inexplicably, a side blind-zone alert system is standard and available only for the LTZ trim level. As far as crash-test ratings are concerned, the National Highway Traffic Safety Administration (NHTSA) gives the Traverse 5-star ratings for every assessment except rollover resistance, for which it rates 4 stars. The Insurance Institute for Highway Safety (IIHS) is equally impressed, giving the Traverse its highest rating of Good in nearly every test, combined with a Basic front crash prevention rating. Note that as this review is written, the IIHS had not performed the tough new small-overlap frontal-impact test on the Traverse, precluding it from joining the organization’s Top Safety Pick list. Three key characteristics help ensure the 2014 Traverse remains appealing in terms of cost effectiveness, despite merely average ratings for quality, reliability and depreciation. The first is that this full-size SUV is far more fuel-efficient than a traditional big SUV. The second is that it is just as roomy as a Chevy Tahoe inside. The third is that Chevy dealers offer big discounts in order to keep Traverses rolling off lots and into driveways. Right now, as this review is written, Chevy dealers are offering a $2,000 rebate, or 0-percent financing for 60 months combined with a $500 rebate. If you’d rather lease, the deals start at about $340 per month with nothing down, though you’d need outstanding credit to make that happen. Otherwise, plan on putting about three grand down and enjoying a $259 monthly payment on the Traverse LS. Certainly, these discounts, coupled with free scheduled maintenance for 2 years or 24,000 miles, help take the edge off a 2-star cost-of-ownership rating from Vincentric. Plus, it is worth noting that TrueCar reported substantial price discounts starting in November of 2013, after Chevy dealers had cleared 2013 models out of inventory. Our advice? Take some of that savings, get yourself an extended warranty, and choose a Traverse over a Tahoe or Suburban, unless you really need to tow more than 5,200 pounds. 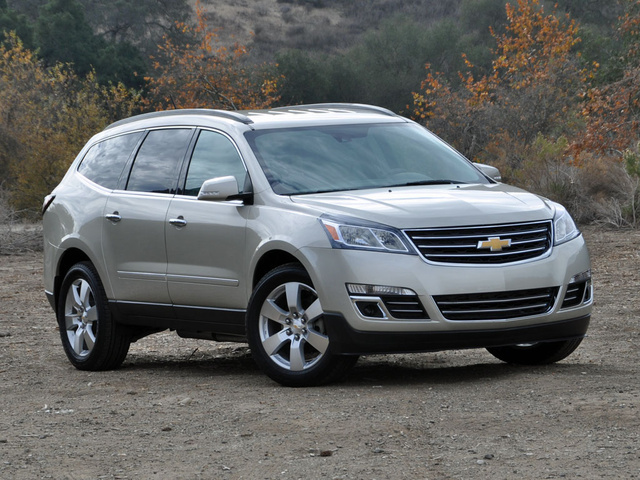 What's your take on the 2014 Chevrolet Traverse? JackTB The Power liftgate has no adjustment and hits the overhead garage door. The Equinox has it why not the 2014 Traverse? BOBRL71 BOBRL Since new the front collision alarm works 60% of the time. have quarried it on line, found out this has been a problem since 2012. has Chevy come (GM) come up with a "working fix"? 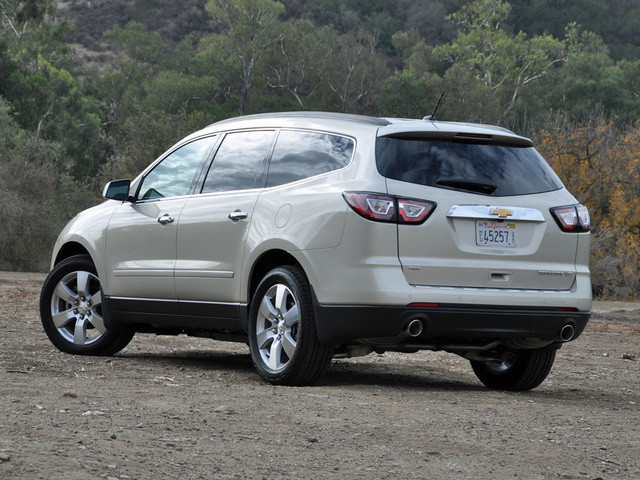 Have you driven a 2014 Chevrolet Traverse?